QGenie QG-103N - ACE Peripherals ::: Completing I.T. QGenie is a power bank that can charge your mobile devices, coupled with a mobile NAS function to centrally store your photos, music and files. With QGenie, you can create a personal cloud for convenient remote file access and sharing on the go. QGenie also enables you to easily back up and retrieve your phonebook from mobile devices, share Internet access as a wireless access point (AP), and is ideal as an in-vehicle media center for streaming music to a car stereo from a Bluetooth-enabled mobile phone and playing various media formats across different mobile devices, allowing you to enjoy the utmost convenience when outside. With a 3000mAh power capacity, QGenie can serve as a power bank to charge your mobile devices via USB connection* at an outstanding conversion rate of up to 90%. A fully-charged QGenie can provide approximately 1.5 times the battery capacity of the average smartphone, 2 times that of an MP4 player, and takes less than 2 hours to fully charge those devices. *The charging time may vary due to environment and devices used. Charge QGenie and another mobile device at the same time with just one adaptor. QGenie provides a hassle-free, 3-step solution to back up the contacts on your mobile devices, and to restore them at any time by using the Qfile mobile app. With scheduled backup, you don't need to worry about losing your important contacts when your phone breaks or is lost. QGenie also allows contacts to be restored across Android and iOS devices, making it ideal for those who have multiple phones or when they switch to a new one. With just two simple steps, you can start experiencing the convenience of NAS and enjoy centralized file storage, backup, and sharing anytime by using the Qfile mobile app. The pocket-sized QGenie makes file sharing on the go simple & easy by allowing connections from up to 20 devices including PCs, Macs, Android, and iOS devices via wireless LAN and also by supporting simultaneous file access by up to 8 devices. *To fully enjoy the functions of QGenie, please update your Qfile to version 1.6.0 or above. You can take photos with your mobile devices and upload to the organized file folders on QGenie manually or automatically for easy sharing with your family and friends without the need of sending emails or exchanging USB drives. When fully-charged, QGenie can provide service for more than 10 hours – more than enough for the average day's use. You can take QGenie anywhere and enjoy your private media collection across multiple devices wirelessly via the Qfile mobile app. The built-in myQNAPcloud service allows you to remotely access all of the files stored on QGenie and connected USB drives while you are away, allowing you to build up a cost-effective private cloud. You can quickly share Internet access with QGenie through wired or Wi-Fi connections, smartphone hotspots, or an LTE/4G/3G dongle wirelessly and securely to multiple devices. It can save in Internet costs if you are traveling with multiple devices but have a limited Internet plan that can only serve one device. In addition, if you are using QGenie with a smartphone hotspot, it not only delivers stronger Internet signals but also charges your smartphones at the same time for worry-free usage. With support for various media formats (including MKV, WMV, and RMVB), QGenie works perfectly as an in-vehicle media server that allows you to easily share multimedia with other passengers. You can also stream music stored on QGenie with a Bluetooth-enabled smartphone to the car stereo. When connected to a PC or Mac, QGenie automatically turns into a high-performance portable 32GB SSD, providing extremely fast file transfer speeds of up to 120MB/s read and 40MB/s write via USB 3.0. 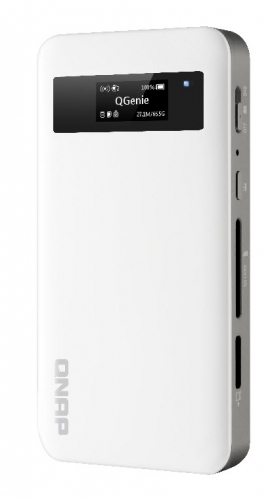 By using SD cards and USB drives, QGenie is expandable up to 2TB capacity to store additional data and files. You can also connect QGenie to a Smart TV to enjoy your photos, music, and videos in your living room. QGenie can work with a QNAP Turbo NAS for flexible expansion capabilities. You can conveniently copy files from QGenie to the Turbo NAS with the USB one-touch-copy function and vice versa. When connecting to a PC or Mac with Qsync enabled, all of the files on QGenie can be automatically synchronized with your Turbo NAS, offering a scalable expansion solution to fulfill your needs in archiving rapidly-growing data and files. The clear OLED display keeps you updated on QGenie's condition, providing a detailed overview on system, network, battery, and USB SSD status. With the easy-to-use slide switch design, you can conveniently turn on/off the QGenie and switch between Wi-Fi and power bank functionality to meet your various needs. Professional photographers can quickly run out of SD card storage space. With its SD card slot, QGenie is a convenient mobile card reader allowing you to quickly copy the contents to QGenie to make room for even more photos without a PC or Mac. With just 3 steps, you can connect to a Wi-Fi connection and share the Internet with your mobile devices. Step 1: Connect your mobile device to QGenie by using Qfile. Step 2: Go to [Setting], choose [Internet] and then [Wireless Internet]. Step 3: QGenie will display all the available Wi-Fi connections, choose the one you want to connect to (and enter the password if necessary), and select [OK]. Various handy utilities are available for you to work smartly with your Turbo NAS. These utilities help increase your productivity and make it absolutely easy with connecting the Turbo NAS, setting up the system, data backup and synchronization, downloading files, and so on. Visit the Download center, find your Turbo NAS model, and the list of available utilities are ready for you. * Please note that QGenie only supports Qfinder (Windows) and Qsync (Windows). (**) The support of all formats comes from the mobile devices or 3rd party software. QGenie and Qfile don't encode/decode the multimedia data.